Dr. Prager publically announced his retirement early in the 1947-1948 season, stating that "the responsibility of directing civic music whould be placed on younger shoulders." (Ironically, the orchestra's second Music Director, Walter Heermann, did not possess "younger shoulders"—he was only a year or so younger than Prager!) I originally suspected that his retirement might have been in part due to bad feelings between Prager and Civic Music: things like the Kunrad Kvam affair of 1946, and other skirmishes with various musicians and board members. In talking to those who knew him, though, I found no evidence of this. He seems merely to have wanted to retire to a more relaxed life. At his farewell banquet in June 1948, Prager explained: "I have been asked privately why I am retiring. I have no reason to retire—no complaints about work or salary or anything. I am just putting into effect a youthful ambition...that whenever I am quite happy with my work and with my life, I won't gamble with happiness. Then, if I am financially able to so, I shall refuse to take the chance of destroying that happiness." The local press was lavish in their praise of the retiring Prager. A State Journal editorial early in the year commended him for "...a job splendidly done, not only for Madison, but for others who have envied our lot, and can copy our recipe for its making." On the day of Prager's final concert, William Doudna of the Journal wrote: "Prager's career here has been that of a genius...in the sense that it is a rare man who can weld amateur, professional, and semi-professional musicians into a homogenous whole. And he has poured love into his work--a love for music, the kind that requires that it be shared with as many as can come within the sound of it." Prager's retirement seems to have been happy: he and his wife Frances moved to her native Argentina in September of 1948, and apparently enjoyed themselves . Prager remained in close contact with friends in Madison, and after the tradition of the times, some of his letters were published in the local papers. Letters he wrote to Alexius Baas and Betty Cass in the spring of 1949 are filled with details of life in Carlos Paz, a town near Buenos Aires, appreciative descriptions of local food and wine, and plans for a European vacation. He retained a great affection for Madison—according to his former piano student Gerald Borsuk the Pragers' home in Argentina was named "Villa Madison." Prager had originally been engaged to teach at the University in the spring of 1949, but he wrote that "commitments" would keep him in South America," and declined the University's offer. Though he did conduct orchestras in Argentina, I suspect his "commitments" had more to do with an enjoyable retirement than professional engagements! In 1951, Prager became the conductor of the Philharmonic Orchestra of the Agentinian state of Punilla, but he did return to Madison twice to teach at the University. For most of the 1951-1952 school year, he taught conducting at the UW School of Music. He returned more briefly in the fall of 1953—his last visit to Madison—to give eight lectures on the "Masterworks of Opera" at the UW Extension. The Pragers continued to travel in Europe and South America after this, but spent most of their time in relatively quiet retirement. He died at age 85 in April of 1974‚ news which did not reach Madison for six months. The MCMA had written to see if he would be interested in traveling to Madison to take part in the orchestra's fiftieth anniversary in 1976-1977, only to find that he had passed away. At a MSO concert on January 31, 1976, Roland Johnson programmed a transcription of Bach's chorale prelude In Our Hour of Deepest Need as a tribute to the orchestra's first conductor. When Prager announced his retirement, the MCMA board started the search for a new Music Director. In reality, though, Prager had a great deal of influence over the process, and Walter Heermann, MCMA's second Music Director was his hand-picked successor. Prager and Heermann had met when both were teaching at the University's Summer Music Clinic. Like Prager, Heermann was German. Born in Frankfurt in 1890, Heermann came from a musical family. His father, Hugo Heermann, was a virtuoso violinist who was a close friend and associate of Brahms--the composer often visited their home when Walter and his older brother Emil were young children. His debut performance as a cellist was with his father and was conducted by Richard Strauss. In 1909, Hugo Heermann came to the United States to become Concertmaster of the Cincinnatti Symphony Orchestra, bringing his sons with him. Both Walter and Emil, a violinist, took positions in the orchestra as well. Both brothers remained in the orchestra for nearly 40 years. Emil succeeded his father as the orchestra's Concertmaster. Walter started as last chair cello in 1909, but eventually became the orchestra's principal cellist. In a 1949 interview, he noted that: "I think that I'm the only cellist who occupied all of the chairs—from sixth to first." Descriptions of Heermann's playing from those who knew him are very complimentary--he was obviously a fine player who had an unbelievably large sound. James Crow, who played viola in the Civic Symphony under both Heermann and Roland Johnson, remembers hearing a concert in the 1960s, when Heermann was asked to play principal cello in the University Symphony. According to Crow, "There were a lot of cellos there, but all you heard was Walter." I have heard one recording of Heermann as a player, a rare LP that has a series of live performances of works by Madison composer Sybil Hanks. Heermann premiered Hanks's Meditation at this program, and it is a lovely performance with a very large and deep sound. [This performance can be heard on the Historical Recordings page.] Though he only played one concerto with the orchestra--he and his brother Emil performed Brahms's "double" concerto to close his first season in Madison—Heermann played chamber music in Madison throughout his tenure as Music Director and well into his retirement years. The other side of Heermann's musical career was conducting. He had fine models: at Cincinnati, he worked under both Leopold Stokowski and Eugene Goosens. By the 1930s, he was frequently filling in as a guest conductor, and had the title of Assistant Conductor when he retired from the orchestra. (He returned to Cincinnati at least once after taking the position in Madison to conduct the orchestra there.) He had occasional guest conducting engagements, and served as the director of the Charleston (WV) Music Festival from 1931-1942. Again, those who played under his baton are complimentary: Heermann knew his scores very well and was extremely effective in communicating his musical ideas. When he retired, he donated his entire collection of orchestral music to the MCMA—some 200—and a even quick glance through the scores in this collection shows evidence of his close study and preparation of each piece. Why did Heermann, who was nearly 60 when he moved to Madison, take this position? Roland Johnson, who had been a protégé of Heermann's in Cincinnati, feels that it was at least partially a reaction to a changing situation there. 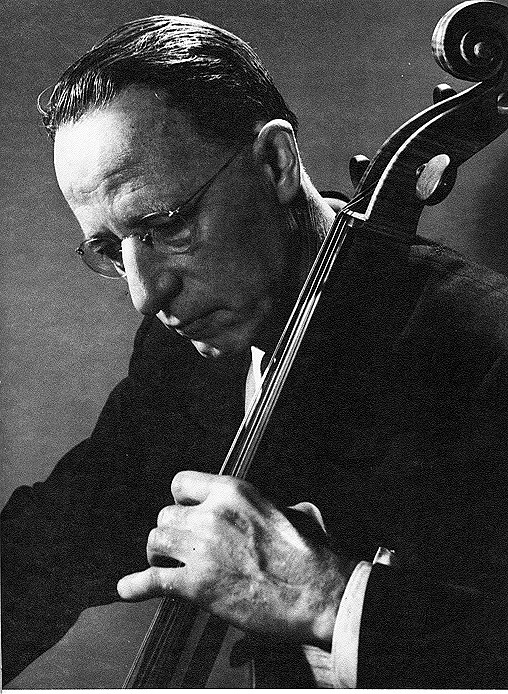 Emil Heermann had been moved (unwillingly) out of the Concertmaster's chair a few years earlier , and Johnson felt that Walter Heermann saw "the writing on the wall" regarding his own position as principal cellist. However, Madison also provided a chance to conduct—something that had been more and more part of his activities with the Cincinnati Symphony during the 1940s. The Madison Civic Symphony, though not a professional orchestra, had been built by Prager into a respectable amateur ensemble capable of tackling a variety of challenging works. "Dr. Prager's final and friendly counsel was: 'Now don't change anything!' And generally we did adhere to the well established routine of Civic schedule. Quite naturally, when a man of his caliber's achievements leaves for good, you will find that a number of members leave with him, and so with us--a somewhat smaller orchestra and a quite diminished chorus reported last fall—so one thing was almost had to change was the choral repertoire, substituting, not lighter perhaps, but shorter a capella choruses, cantatas, etc., for the usual and annual big oratorio or opera. In the long run, this procedure, including an added solo concert for the Chorus, actually gave them a wider range of activities, fitting with their size and capabilities. We did keep up the annual Messiah performance just before Christmas and again, this concert drew a capacity crowd. I am quite aware that some of our older Chorus members have missed the glamour of King David and Samson and Delilah gala nights, and it is also obvious that the don't recall one feature of those past glories. The Missa Solemnis and like performances were made possible through Dr. Prager drafting as 'guests' almost every good voice from other choral organizations all over town and University, a process I have no access to nor inclination for--I can only tell this to our ambitious souls: Give us time and a better Chorus, and you shall have Beethoven's Ninth or Bruckner's Mass in no time!" "Programs: We will continue to present the best there is in orchestral and choral repertoire. Soloists: We are going to feature young American artists of proven worth, but just before they rate a New York manager and a large fee. Attendance: we played to about 6500 people last year, which is not impressive. We hope to improve this record by advertising more than we have been... Finances: Our big wish came true—we finished in the black—in fact, we don't recognize red as a financial color any more, but we do hope to finish next season with enough surplus to for a reserve fund or to spend same in a way where it will be a real help for Civic Music." "They didn't have anybody who was actually a bass clarinetist to play the Nutcracker--you know the part [in the Dance of the Sugar Plum Fairies] 'ta-da-da-da-dah.' So they asked me if I could play the bass clarinet. I said that I didn't know, I'd never tried, but that if they gave me the the instrument for a couple of weeks, I could probably play that short little solo... Anyhow, Walter was conducting, and we had a pair of very excellent dancers from New York...who were to do the Dance of the Sugar Plum Fairies. They came on stage, and I played my solo--'ta-da-da-da-dah' and then nothing happened. There was a pianist who was playing the celeste part, and she was looking off to the stage at the dancers. So Walter started whistling..."
Gerald Borsuk--for many years an oboist in the Civic Symphony, and a piano soloist on two occasions--recalled a similar incident in a performance of the Gershwin Concerto in F, in which he was the soloist. One of the most dramatic moments in the concerto is puntuated by a great crash on the gong. Heermann borrowed a gong from Chicago for this performance, and when the climactic moment came gave a large and dramatic cue...to absolute silence! Lest these anecdotes leave the wrong impression, it should be noted, that the Civic Symphony's performances under Heermann were generally quite good. Though Heermann was never able to recruit quite enough string players to adequately balance the brass and woodwinds, recordings of the orchestra from the 1950s reveal an ensemble that is generally accurate and quite musical, if clearly a largely amateur group. 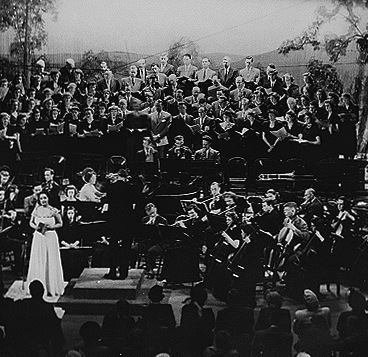 The Madison Civic Symphony and Chorus in the 1950s. With Heermann's first season in 1948-1949, there was a marked change in the character of the orchestra's repertoire. Heermann had come to Madison after nearly forty years in one of America's leading professional orchestras, and the Civic Symphony's programming began to resemble that of a professional orchestra. Where Prager had favored large "extravaganzas" with multiple groups and sometimes a dozen or more works, Heermann's orchestra concerts seldom featured more than three or four pieces, most often in a format that is now more or less standard: an opening overture, followed by a concerto, with a larger symphonic piece after intermission. Not suprisingly, given Heermann's background, the orchestra's repertoire also took on a distinctly German-Austrian character, and the works of Brahms were given pride of place. All four of Brahms's symphonies were performed during his tenure, as well as both piano concertos, the violin concerto, the "double" concerto, and choral works like the "alto rhapsody," Nanie and the German Requiem. Beethoven, Schubert, Haydn, Mozart, Handel, and Bach were also heavily featured in these years. This is not to say that Heermann neglected other "non-German" repertoire, however. The orchestra's programming included works by composers as wide-ranging as Milhaud, Sibelius, Kodaly, and even Monteverdi. Heermann was obliged to spend some years rebuilding the Civic Chorus. Many longtime members had retired with Prager, and there had also been a loss of membership a few years earlier, when several singers from the Chorus left for the Philharmonic Chorus. Heermann featured the Civic Chorus every spring in a choral concert. For the first few years, these programs contained a variety of works in the older tradition of Prager, usually with piano accompaniment. Increasingly though, Heermann used the spring choral concert for larger, more ambitious works "the usual and annual big oratorio" of years gone by: Mendelssohn's Elijah (1951), the Brahms German Requiem (1952), Verdi's Requiem (1954), Rossini's Stabat Mater (1955), Orff's Carmina Burana (1956), Beethoven's Mass in C Major (1957) and the Kodály Te Deum (1961). The annual Messiah tradition begun by Prager continued through the 1950s. By the time Heermann took over in 1948, the December Messiah concert was almost sacrosanct in Madison, and Heermann continued to conduct the oratorio much as Prager had: with full Romantic orchestra and many cuts. Heermann tinkered with the tradition, however; in particular, spreading the arias out among as many local singers as possible (some Messiah performances in this period featured nearly a dozen soloists). In December 1957, Heermann programmed what was billed as the Civic Chorus's first "complete" Messiah. This uncut version of the work was spread out over two performances, one in the afternoon, and one in the evening. While Prager had been able to mount several operas in the 1950s, MCMA did not sponsor any fully-staged operas during the 1940s and 1950s. (Staged opera performances would return in the 1960s with the arrival of Roland and Arline Johnson, and the creation of the Madison Civic Opera Guild.) However, MCMA did present several concert versions of operas under Heermann's direction. These performances, which sometimes took the place on the spring choral program, featured local singers in the solo roles. MCMA presented four of these concert operas in the late 1950s: Cosi fan tutte (1956), Act III of Die Meistersinger (1957), Ariadne auf Naxos (1958),and Cavalleria Rusticana (1959). 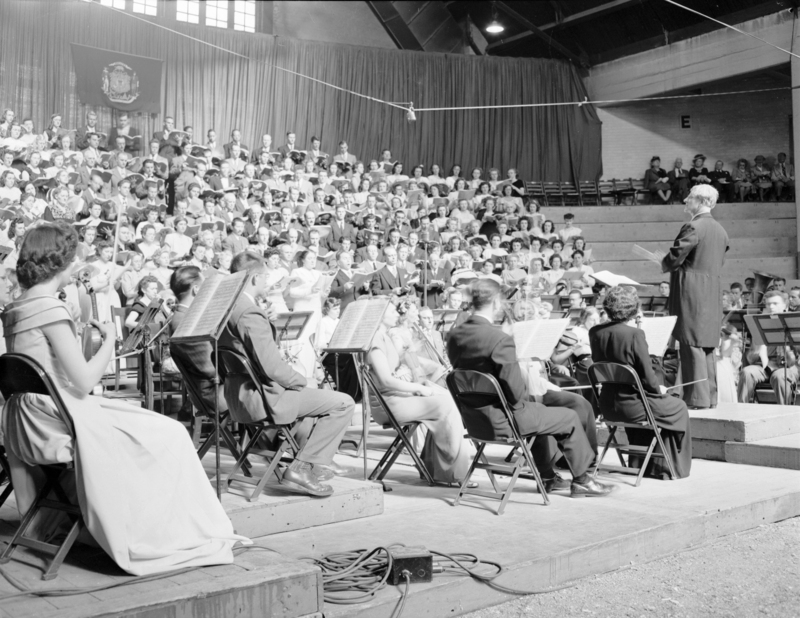 Youth concerts had been part of the orchestra's programming in the early years, but during the late 1930s and early 1940s, this function was largely taken over by the WPA-funded Madison Concert Orchestra. Heermann reinstituted regular "Young People's Matinees" in the 1949-1950 season. Heermann's youth concerts (undoubtedly modelled upon concerts he had conducted in Cincinnatti) were aimed at education and featured pieces that were designed to be entertaining to a very young audience. Innovation was very much a part of these concerts, as in the first program when a local art teacher, David Carman, sketched a series of abstract images on an overhead projector as the orchestra played a Weber overture. MCMA worked closely with local teachers to run an essay contest in connection with these programs. Most importantly, they also featured children themselves: small ensembles from various studios, and soloists selected through an MCMA-sponsored "talent contest." These matinees were tremendously successful, beginning a tradition of educational outreach that continues fifty years later. Another innovation introduced by Heermann in his last years was an annual Pops concert. Prager had occasionally programmed "popular concerts" in his earliest seasons, but these consisted of little more than a collection of movements from works done in the season, repeated "by popular demand." Heermann had wanted to program a series of Pops program from the very start of his tenure in Madison, and was working from very different model: the Cincinnati Pops Orchestra had been very much a going concern in his years in Cincinnatti, and with the more famous Boston Pops had established a distinctly American style of concert. The first Pops program, or "orchestra gala," on April 30, 1960 at the Loraine Hotel, was very much in this mold, presenting a series of very light and entertaining works in a socially informal setting. The first program drew on works by Johann Strauss, Suppe, and the most well-known of American light composers, Leroy Anderson. This program was run as a benefit by the Women's Committee, and was a great financial and social success, though some community members were upset that the Civic Orchestra was charging for tickets. Heermann's final concert as the orchestra's Music Director was the second Pops program, on April 29, 1961. In reading between the lines of Board minutes during the Prager years, it seems obvious that while the MCMA Board was nominally in charge, Prager and the Vocational School's Alexander Graham made most of the real decisions. The Board, which expanded from 20 members in the early 1940s to 30 members in the 1948-49 season began to take a much stronger hand in running the affairs of the MCMA during the 1950s. The MCMA Board was led by a series of local women from the community all through Heermann's tenure—Florence Anderson (1946-49), Stella Kayser (1949-51), Eleanor Carter (1951-53), Eugenie Mayer Bolz (1953-59), and Viola Ward (1959-61)‚and the membership of the board was largely made up of women who volunteered to run the support activities of the orchestra, from marketing and fundraising to answering phones and stuffing envelopes. Helen Supernaw, who served on the Board throughout this period was particularly instrumental in day-to-day operations: in essence, she was the entire administrative staff of MCMA, running the office, overseeing printed programs, and taking care of countless details...all as an unpaid volunteer. The organization's budget was never large in the 1950s—total expenditures never exceeded $6000 per season—but through the Board's efforts, MCMA was able to maintain the tradition of free concerts throughout the 1950s. With well-attended concerts and outreach programs like the annual Young People's Matinee, the orchestra and chorus were very much a part of Madison's cultural life, and were frequently mentioned with pride in Chamber of Commerce pamphlets, and other literature promoting the city. Heermann was a strong believer in the American Symphony Orchestra League, and MCMA joined the ASOL in his first season as Music Director. He would attend the annual convention, or would arrange for one or two Board members to attend each year. Viola Ward and Helen Supernaw attended one such meeting in 1954, and returned convinced that some sort of auxiliary organization could be be useful to the MCMA. The Women's Committee organized in 1956 proved to be a success: running social events to benefit the orchestra and beginning a series of educational efforts. Later reorganized as the Madison Symphony Orchestra League, this vital organization continues to provide invaluable volunteer and financial support today. One of Madison's most rancorous political issues in the 1950s was the ultimately unsuccessful attempt to build a Frank Lloyd Wright-designed community center. The original design included a civic auditorium, and as early as 1947, local aldermen had approached MCMA for support in pushing the project through. Heermann and other Civic Music representatives were active throughout the late 1950s on city committees devoted to the Community Center issue. In the end, this issue was tabled—for nearly 30 years!—when community support was lacking. The present Monona Terrace is of course the result of the successful political efforts in the late 1980s and early 1990s to resurrect Wright's design, but reconfigured as convention center. In the meantime, the orchestra continued to search for a performing space. The Masonic Temple Auditorium had been the primary venue for Civic Orchestra and Chorus concerts since the late 1930s. It is a visually impressive space, and its resonance makes it admirably suited for Masonic speeches and ritual, but the Temple was an acoustical nightmare for orchestra players. At the beginning of the 1953-54 season, Heermann moved concerts back to the orchestra's first home, the Central High School Auditorium. Heermann worked valiantly in the 1950s to make acoustical improvements to this space and to extend the stage to accomodate larger choral and orchestral forces. (Unlike his predecessor, Heermann never programmed a concert in the Stock Pavilion, arguably the best acoustical space in town at the time.) Central High School Auditorium (later MATC Auditorium) would remain the orchestra's home until the opening of the Oscar Mayer Theatre in 1980. Brahms's Alto Rhapsody, with soloist Nan Merriman. One of the more controversial moves during Heermann's tenure had little to do with the music itself, but had an enormous long-term impact on the course of the orchestra's growth. Since the very beginning, the Civic Symphony had been largely a volunteer organization. A few musicians did indeed get paid by the Vocational School: concertmaster Marie Endres was paid a relatively modest sum per service, which included her supervision of hundreds of string rehearsals over the years , and the principal cellist and librarian also received a small honorarium. The few Musician's Union members who performed with the Symphony received a small payment for performances. We may speculate that the occasional "ringers" brought in by Prager for performances through the 1930s and 1940s--mostly professional players from Milwaukee--may have received some sort of payment, though no record exists in the MCMA financial records. (There had undoubtedly been some sort of private arrangement.) There were also occasional WPA players in the orchestra, who performed as part of their federally-funded activities. The vast majority of players in the early 1950s were still rehearsing and performing for free, however. The issue of paying the regular members of the orchestra has it roots in the 1950-51 season. At this point, the only pay available to most players was free babysitting arranged by the MCMA: available to those members (mostly women and the several husband-wife pairs who played in the orchestra) who could not otherwise play for performances. Heermann reported that the draft (now in in full force during the Korean War) was beginning to have an impact on the membership of the orchestra, and asked the Board for permission to hire substitute players. After some discussion, the Board tabled the matter of establishing a regular fund to pay substitutes, but did allow Heermann some discretionary funds. The matter remained officially tabled for the next several years but Heermann apparently used rather wide discretion in bringing in players, particularly in the string section, the Civic Symphony's weak link during this period. It also became traditional for a few of the prominent players in the orchestra—the principal strings and the principal trumpet—to receive a bonus check from the MCMA at Christmas. By the end of the 1950s, the majority of orchestra members were in fact being paid for performances, though not by the MCMA. Members of American Federation of Musicians, Madison Local 166 received a performance fee (about $7.00) which was funded by the Music Performance Trust Fund. The MPTF, a fund created from royalties paid to the national union was used (and is still used) to support live performances. Even this relatively small amount caused some controversy within the orchestra and among its supporters. Gerald Borsuk relates that there was occasionally friction between those orchestra members who were being paid and those who weren't. Memories of the Prager years were still fresh in the minds of many longtime supporters, who held to his ideal of civic music as a "fine democratic effort," created for the sheer love of music. James Crow noted that there were several vocal opponents to allowing pay of any kind to the members of the orchestra. 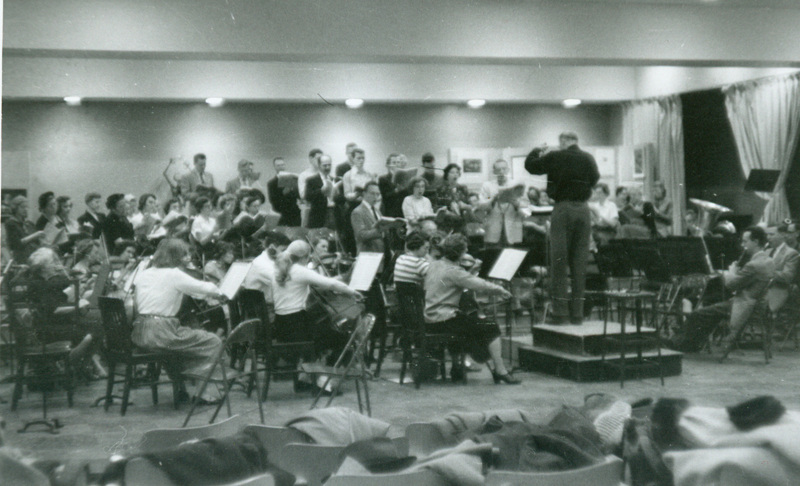 It was not until long after Heermann retired that the orchestra concluded its first Master Agreement with the MCMA, but the 1950s saw first steps towards putting the Madison Symphony Orchestra on a fully professional footing. In early 1960, the Vocational School caused a flap locally when it announced that Heermann had to leave his post. According to agreements reached in the earliest years of the MCMA, the orchestra's Music Director was paid by the Vocational School, and Heermann had by then reached the mandatory retirement age of 70. There was an outcry among musicians and community members, with petitions and open letters protesting the Vocational School's policy. In March of 1960, the Vocational School and MCMA reached a cordial agreement that allowed Heermann to stay on for one additional year, through the end of the 1960-61 season. This would allow the MCMA some fourteen months to conduct a search for Heermann's successor. However, once again, the orchestra's Music Director chose his own successor. According to James Crow, "Walter stayed on that extra year to allow Roland [Johnson] time to get here. "—a story confirmed by Mr. Johnson. At his final Board meeting, Heermann wryly misappropriated a famous quote, remarking that: "Old conductors never die...they just quietly leave town." Despite this, Heermann settled down to a quiet retirement in Madison. He continued to play chamber music with friends and to teach private cello students in Madison and Milwaukee throughout the 1960s. He died in Madison on June 10, 1969 after a brief illness. As he would do for Prager several years later, Roland Johnson programmed a special work in memory of Heermann at an orchestra concert the next season: Barber's Adagio for Strings. Each of the four men who have led the Madison Symphony in the last 75 years has made a unique and lasting contribution to that history. Naming Sigfrid Prager as our Founding Father in not merely histrionics. Prager's work carried the orchestra through its first twenty-two seasons--through enthusiam, and, at times seemingly, through sheer force of personality. If Walter Heermann played a somewhat more reserved role in his thirteen seasons, it was a no less significant contribution. Under his leadership, the orchestra's programming acquired a degree of "big city" polish, and the orchestra itself began to make the transition from an amateur group to the professional ensemble that exists today.